The Cult Edition is a modern collection of hosiery and seamless garments made to fit both genders. Its comforts spread from the legs to the whole body! Emilio Cavallini is not new to men's clothing. In 1987 Emilio Cavallini was known all over Europe for his line of men's avant-garde clothing and socks. 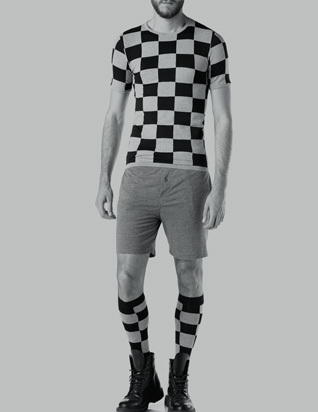 The collection covers a wide selection of Socks, Mantyhose, Meggings, T-shirt and Underwear. Meaning: tights for men. From "man" + "pantyhose". Sometimes known as "brosiery" or "guylons". Fashion-forward guys are wearing them with shorts, cropped trousers and worn-out jeans with holes. Mantyhose can also be worn for lounging around at home. Reveal as little or as much as you dare! Emilio Cavallini's Mantyhose are actually unisex. They come in a range of more patterns like skulls, checks, stars, horizontal stripes in black-white or black-grey. 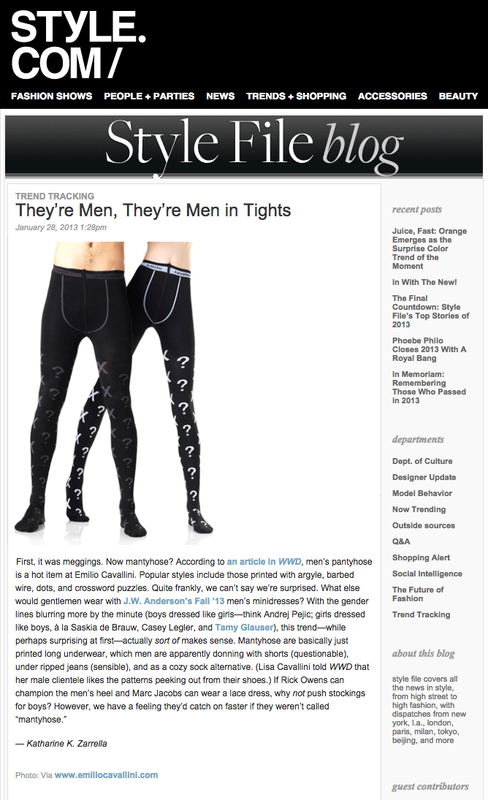 "Male hosiery could be the next billion dollar undergarment idea"
"Mantyhose on display on men's legs in New York"
"UOMINI, TUTTI PAZZI PER IL COLLANT!" "Collant da Uomo, il ritorno nel guardaroba maschile?" "UOMINI CHE COPIANO LE DONNE"
"Fingono di comperarli per la findanzata ma i collant sono per lui"